The challenge is to form as long a word as you can in each turn. Words are formed by clicking and dragging between letters in the game board and when the click is released, the word formed collapses and gets removed, while new letters drop and are added into the game board. After each successful word formed, you will get new letter tiles to play with and additional points. Each letter has its own corresponding points, and letters hard to form words with – like J, X, Z, or W – are worth more points. This point system is similar to popular word games like Scrabble. Words that total to a certain amount of points create a green, gold, sapphire, or diamond tiles. These special tiles increase the points of the letters, allowing you to progress further into the game. From time to time, you’ll get red burning tiles. These letters burn the tile below them after each turn. Once these burning tiles hit the bottom of the board, you’ll lose the game. The challenge with this type of tile is to eliminate them by using them to avoid defeat. Throughout the game, you’ll get bonus words to look for – posted on the upper right hand corner of the board. By forming bonus words, you’ll get additional points to further your gameplay. The game employs a ranking system, growing progressively harder as you move from one rank to another. Tiles’ points also increase as you go further into the game, allowing you to gain more points. 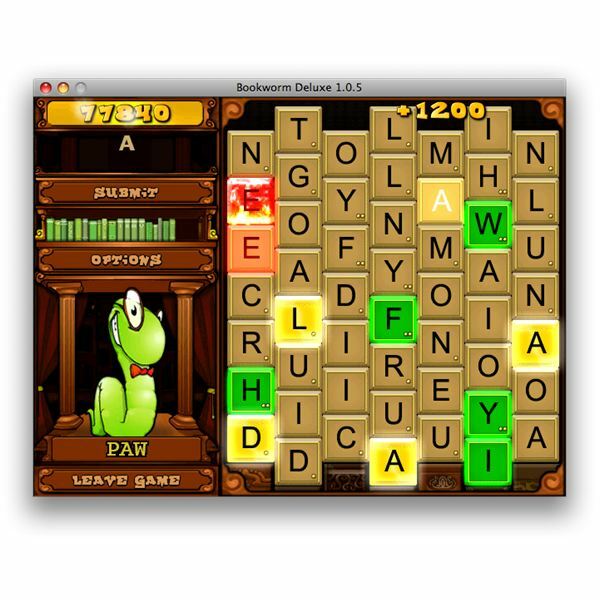 Bookworm’s smooth graphics, combined with challenging gameplay, makes it a treat to play. The game’s audio is appropriate and configurable should you wish to play with or without sound effects or background music. Interestingly enough, apart from being entertaining, this is also an informative game. Certain words you’ve formed will prompt Lex (the Bookworm) a non-obtrusive pop-up of its definition. What makes this game worth it is that this it’s virtually endless. Also, the game’s Hall Of Fame can challenge you to play the game even more. Bookworm Deluxe is a new game every time you start. This is a game you’d like to play over and over. You can play a limited version of Bookworm for free online or buy the app from PopCap Games. You can also download a trial app from the site by clicking here. Bookworm was also just recently released as an iPhone / iPod Touch app in the iTunes App Store. There is a wide array of casual games available for the Mac – from classic board games, classic card games, puzzle games, board games, to action/arcade games. This series of articles discusses a handful of great casual games that can entertain all kinds of users of all ages.